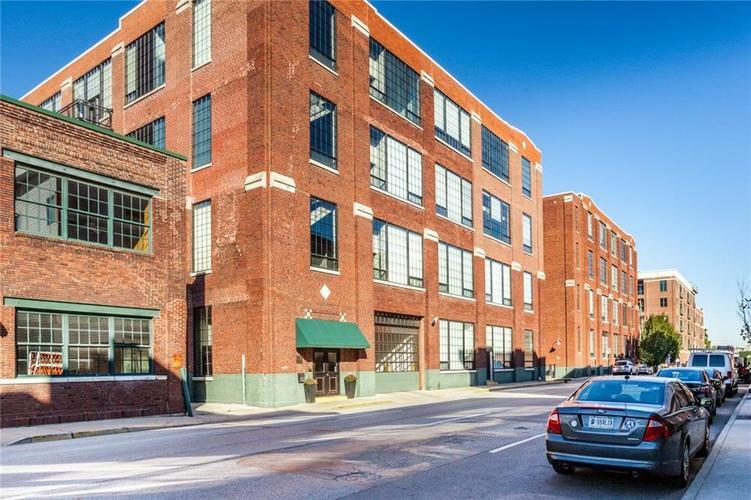 Urban loft living at one of the best historic buildings downtown! Enjoy the soaring 15 ft ceilings, massive windows and exposed brick walls and wood structure. This condo is packed with upgrades: hand scraped Acacia hardwood floors in both bedrooms, stained and polished concrete floors in combined Great Room, Dining Room and Kitchen, LED fireplace and more! Take advantage of the fully landscaped and furnished Urban Garden, featuring mature trees, a fire pit and gas grill, and newly furnished Rooftop Patio overlooking the downtown skyline. All just steps away from downtown Indy’s premier Mass Ave dining, nightlife and entertainment district, and the Cultural Trail. Welcome home to Mill 9 Phase 2 - Unit 202! Directions:From Meridian St, turn east on North St to College Ave. North on College Ave to building on west side of street. 1/2 block south of Mass Ave. Parking on both sides of College Ave. Green awning above entrance.